This afternoon, the Army West Point football team will meet arch-rival Navy for the 119th installment of the greatest rivalry in all of sports. Although the Army-Navy game is always important, this one is particularly special to me because Army will be honoring the soldiers of the 1st Infantry Division, better known as The Big Red One. The Big Red One has a long and storied combat history extending back to World War I, when it marched into battle under the command of General John “Blackjack” Pershing (West Point Class of 1886). In fact, the Army Team is honoring the 1st ID as part of the effort to commemorate the 100th anniversary of the end of that war. Organized on June 8, 1917, for duty on the Western Front in World War I, this first permanent division in the regular Army has seen action in all American wars since 1917, except the Korean, and has performed magnificently in all of its service. Often the first unit of the Army to deploy and engage the enemy, the division has been characterized by an ability to learn systematically from experience and to distill this learning into techniques and methods to improve battlefield performance. Central to this learning has been the training of soldiers and the development of competent leaders at all levels. In the process the “Big Red One” (so called for the red numeral that has adorned its shoulder patch since 1918) has also been characterized by a remarkable esprit that has remained with the veterans long after their active service has ended. 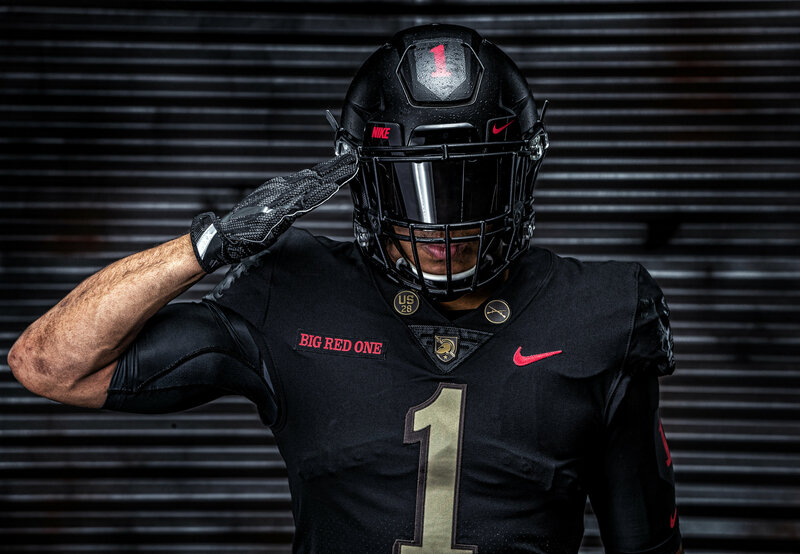 Apart from the remarkable history of The Big Red One, the uniforms to be worn by Army are excellent. As a proud graduate of the United States Military Academy at West Point and as an equally proud Veteran of The Big Red One, I hope you all get a chance to watch the game. Go Army! Beat Navy! No Mission Too Difficult. No Sacrifice Too Great. Duty First! Image courtesy of Big Red One Football.